UPDATE - 7/13, 1:30 pm: In the face of criticism, the Coast Guard just rescinded this policy, allowing reporters free access to Gulf spill recovery efforts. Details below. Effectively reporting on the Gulf oil spill is now a Class D felony, punishable by a fine of up to $40,000. That's right, the most transparent administration in history has made it a felony, effective July 1, to get within 65 feet of what the Coast Guard determines are essential recovery efforts. According to Anderson Cooper, officials tried to up that number to 300 feet. Cooper, who claimed federal officials prevented CNN on two occasions from taking photographs in the gulf, seemed frustrated when he reported on the new laws the day they went into effect. The press is "not the enemy here" he pleaded. The new policies, he said, make it "very easy to hide failure, and hide incompetence." Cooper also let loose this zinger: "Transparency is apparently not a priority with [Coast Guard Commandant] Thad Allen these days." Ouch (full video and transcript below the fold - h/t Ron Robinson). This is but the latest in a string of incidents that seem to have much of the country -- and if Cooper is any indicator, at least a few journalists -- questioning the sincerity of candidate Obama's pledges of transparency, openness, and respect for the press. But these new regulations on press coverage of the spill have not garnered as much attention as perhaps they should -- certainly not as much as similar moves during the Bush administration's response to Hurricane Katrina (a fact that Cooper notes). Shortly after the Hurricane hit, according to the Washington Post, "FEMA refused to take reporters and photographers along on boats seeking victims in flooded areas, saying they would take up valuable space needed in the recovery effort and asked them not to take pictures of the dead." The Post touted claims that the FEMA policy was "in line with the Bush administration's ban on images of flag-draped U.S. military coffins returning from the Iraq war" -- clearly drawing a comparison to other Bush policies rife with accusations of politically-motivated censorship. So far, the Post is silent on the criminalization -- a much stronger statement of administration policy than the refusal to allow embedded reporters on rescue efforts -- of media coverage in the Gulf. With a scant few exceptions, the legacy media are silent on the issue. …the Coast Guard today announced new rules keeping photographers and reporters and anyone else from coming within 65 feet of any response vessel or booms out on the water or on beaches -- 65 feet. Now, in order to get closer, you have to get direct permission from the Coast Guard captain of the Port of New Orleans. You have to call up the guy. What this means is that oil-soaked birds on islands surrounded by boom, you can't get close enough to take that picture. Shots of oil on beaches with booms, stay 65 feet away. Pictures of oil-soaked booms uselessly laying in the water because they haven't been collected like they should, you can't get close enough to see that. And, believe me, that is out there. But you only know that if you get close to it, and now you can't without permission. Violators could face a fine of $40,000 and Class D felony charges. What's even more extraordinary is that the Coast Guard tried to make the exclusion zone 300 feet, before scaling it back to 65 feet. Here is how Admiral Allen defends it. ALLEN: Well, it's not unusual at all for the Coast Guard to establish either safety or security zones around any number of facilities or activities for public safety or for the safety of the equipment itself. We would do this for marine events, fireworks demonstrations, cruise ships going in and out of port. 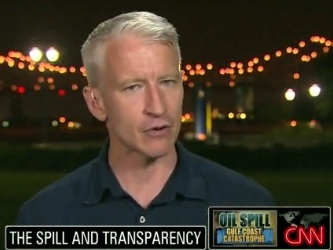 COOPER: So, this is the exact same logic that federal wildlife officials used to prevent CNN on two occasions from getting pictures of oiled birds that have been collected, pictures like -- like the -- well, that we're about to show you which are obviously deeply disturbing, pictures of oiled gulls that we just happened to catch. Suddenly, we were told after -- after that day we couldn't catch it anymore. So, keeping prying eyes out of marshes, away from booms, off the beaches is now government policy. When asked why now, after all this time, Thad Allen said he had gotten some complaints from local officials worried people might get hurt. Now, we don't know who these officials are. We would like to. But transparency is apparently not a high priority with Thad Allen either these days. Maybe he is accurate and some officials are concerned. And that's their right. But we've heard far more from local officials about not being able to get a straight story from the government or BP. I have met countless local officials desperate for pictures to be taken and stories written about what is happening in their communities. We're not the enemy here. Those of us down here trying to accurately show what's happening, we are not the enemy. I have not heard about any journalist who has disrupted relief efforts. No journalist wants to be seen as having slowed down the cleanup or made things worse. If a Coast Guard official asked me to move, I would move. But to create a blanket rule that everyone has to stay 65 feet away boom and boats, that doesn't sound like transparency. Frankly, it's a lot like in Katrina when they tried to make it impossible to see recovery efforts of people who died in their homes. If we can't show what is happening, warts and all, no one will see what's happening. And that makes it very easy to hide failure and hide incompetence and makes it very hard to highlight the hard work of cleanup crews and the Coast Guard. We are not the enemy here. We found out today two public broadcasting journalists reporting on health issues say they have been blocked again and again from visiting a federal mobile medical unit in Venice, a trailer where cleanup workers are being treated. It's known locally as the BP compound. And these two reporters say everyone they have talked to, from BP to the Coast Guard, to Health and Human Services in Washington has been giving them the runaround. We're not talking about a CIA station here. We're talking about a medical trailer that falls under the authority of, guess who, Thad Allen, the same Thad Allen who promised transparency all those weeks ago. News organizations, including The Associated Press, had argued being kept at least 65 feet away from the boom impeded the ability to cover the spill. [Coast Guard Spokesman Cpt. James McPhereson] said the revised policy "will increase the ability of the media and the public to see the response effort."